Humidifiers are portable household appliances which can increase the level of humidity in a room. They are good agents of transition between the temperature outside and the one inside. If you don't use a humidifier, but instead just turn up the heat you risk a few unhealthy effects such as dry skin, sore throat, headaches or itchy eyes. When purchasing a humidifier it is best to try to buy the one which scores more points on the efficiency list in terms of low noise, automatic shut off for electricity savings, ergonomic design, extra features such as air purification and a low water indicator to know when to do a refill. Warm mist humidifiers boil water which evaporates and fills the room. To avoid any sudden increases of humidity, the unit cools the air slightly before release. 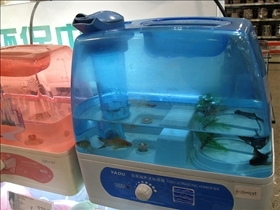 Cool mist humidifiers are made of a reservoir, a wick and a fan. The wick acts as a filter which absorbs the water from the reservoir. The fan is meant to blow air on the wick to accelerate the water's evaporation process. The level of humidity in the room influences directly the output of the cool mist humidifier. As the humidity level increases, the device will decrease the amount of water vapor. The wick of a cool mist humidifier must be cleaned on a regular basis because it tends to favor the development of molds and bacteria. These are potential threats for the health of all those who live in the house as the vapors filled with bacteria are released in the air when the device is running. Fresh water has to be added each time you use the cool mist humidifier. A warm mist humidifier eliminates molds and bacteria through the boiling process. Still, it is safer to have it cleaned on a regular basis to avoid any potential dangers related to bacteria resistant at water boiling temperature. 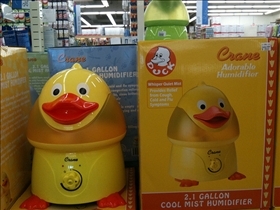 Prices for cool mist humidifiers and warm mist humidifiers range from $40 to $100. If you buy portable devices instead of consoles or whole house humidifiers, you can pay less. The maintenance cost for a cool mist humidifier is higher because the wick needs to be changed as residue from the water can form deposits which affect its performance on the long run. To a warm mist humidifier's initial cost you should add the cost of electricity required for it to boil water. You need to take into account also the cost to replace filter pads. They have to be changed to ensure the good performance of the device. A cool mist humidifier absorbs water through a wick which is then evaporated through the action of a fan. A warm mist humidifier boils the water and releases it as a steam in the room. Both humidifiers can be affected by deposits of mold and bacteria. Both humidifiers have prices of up to $100, but maintenance costs have to be considered. Which is better for a cold?